http://twitter.com/#!/thinkunitUpon his imprisonment, there will be three political prisoners for the Jeju naval base struggle since March 9. The KCTU having a pan-Korean workers’ rally to success the Jeju 4.3 uprising spirit, in the Gangjeong village in the morning of the April 1 demanded no Jeju naval base, no privatization of public institutes and no profit-oriented hospital ( * another project by Samsung), and No ROK-US FTA. When people confronted police tear liquid with sea water in the port, there were also nine members of the national human rights committee who took cameras to record on the police violation on human rights. They were also interrupted by the police. Among 30 people who could eventually reach to the Gureombi rock after hard struggle with the police, Several people including, Hyun Ae-Ja (former National Assembly woman), and Dr. Song Kang-Ho entered the Gureombi Rock crossing wire razor. They were eventually carried by a navy jeep and police took them outside. Br. Song was severely injured when he resisted against arrest of him. The police violently hit him in belly etc. when he was carried in police car from the Gureombi rock to the police station. He was eventually being stitched his neck in the hospital and carried again to the police station despite lawyers’ protest (with his teeth broken). 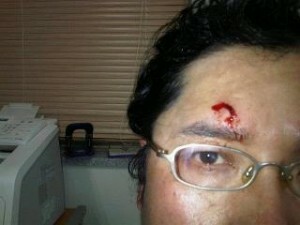 The charge against Dr. Song is damage on property. Eight activists including two key activists were arrested when they blocked police bus chaining their bodies in the center of the village (One was released later). It is told that a person is still in the Gureombi rock. He is told to have insisted to stay overnight there.